How Our Mobile Bar Hire Service Works. We believe that every event is different, so we offer you a free mobile bar hire planning service, where together, we’ll meticulously plan everything in advance of what you want to achieve for your event or special day, making sure nothing is left out. We have a mobile bar that will suit your event and number of guests. We will deliver your mobile bar, set it up and take it away at a time to suit you and your venue. And, best of all, we have no minimum drink spend conditions or penalties. In most instances, all we need is access to a single electrical wall socket, however, we can provide a generator when required. Our mobile bars come fully furnished with refrigerated bottle chillers, optics, ice maker, glasses, napkins, straws and umbrellas. Everything is provided, we can even brand the mobile bar for you, if you are holding a themed or promotional event. We provide a mobile bar hire service everyday throughout the year. However, please call us on 0121 649 6280 or send us an email using our contact form (link) today to check our availability for your event or special day. 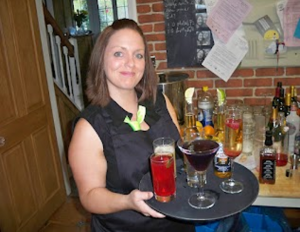 The success of your event or special day is guaranteed with our hospitality trained mobile bar manager and staff. They are well groomed, smartly dressed in clean uniforms and operate under a strict hygiene code, which has won us the 5 Star Hygiene Award. They are professional, courteous, love their work and can quickly build report with your guests, making sure you and your guests are properly looked after and have a very enjoyable time. If you are having cocktails, you can relax because our professionally trained Mixologist will blend and serve the perfect cocktail every time. Our bar staff and glass collectors are guaranteed to amaze you with their courteous and friendly attitude, their drink blending and service skills. We have a wide range of drink glasses to suit any style of event and are supplied free of charge. Should your chosen venue require unbreakable ones, we can readily supply these as well. Our portable bar is fully equipped with optics, bottle coolers, wine chillers, draught drink facilities, ice makers, napkins, straws and umbrellas at no extra cost. We also only use fresh fruit and garnishes when serving drinks, except for the cherries. In the majority of instances, our mobile bars are used at venues where there isn’t a license for serving alcoholic drinks. As part of our mobile bar hire service, we’ll apply and obtain a license for you. This license is known as a Temporary Event Notices (TEN) and the current license fee is £21. This is the only payment we need when confirming your mobile bar hire booking with us. Please allow at least 21 days before your event, so we can obtain your TEN license. We provide the full range of mobile hire packages to suit all types of events, from paid and tab bars to a fixed price per guest. To find which of our mobile bar packages best suits your event, please click here or call Louise on 0121 649 6280.